Comprehensive guide for those eager to learn the basics about wine and much more. Learn how to evaluate and taste wine properly. Warmer climates are creating high natural sugars in grapes, which in turn makes more alcohol. Are lighter alcohol wines the way forward, and will they catch on? Pairing the correct wine with food enhances the flavors of both. Tastes are very subjective, however, see how to analyze the aromas from the wine, and marry them with the right food. Popular red and white grape varieties used for wine production. Find out how different the varieties really are. 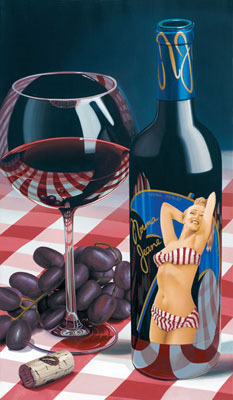 The subject of wine has been used in artwork since the early days of grape growing and wine production. Feast your eyes on some stunning works. Drinking out of a high quality glass definitely makes the tasting experience better. See why, and what to look out for when next choosing your set of red or white wine glasses. This is a great place to see a comprehensive review of all the different wine openers beside each other. More gift options! Have a laugh with these wine gifts and bam-boozle your friends! You'll find loads of ideas for gifts for the wine lovers in your life. Pairing wine and chocolate may sound odd, but take a look here to see how to get it right - and create that near-orgasmic taste experience. Low Alcohol Wine - What Is Your Verdict? Reduced or low alcohol wines are becomming more evident with the gradual rise in world temperatures causing grapes to get even riper. Do you think there is a place in the market for wines at around 6% alcohol by volume rather than the more usual 11-12% wines we're used to? Do you believe that global warming is to blame for the hotter, drier conditions for vineyards or is this just a myth? Have a look at Low Alcohol Wine. Those Fun Wine Labels - Where Are They? Would you buy a bottle of wine with a picture of a celebrity on the label? Probably yes, if it was Marylyn Monroe. Wine labels sell wines, so if you have come across an extraordinary wine label, do send me a copy. I will devote a page to the best, most bizarre or weirdest collection you send in.